The full moon occurs in Ashlesha nakshatra – the nakshatra lord is Mercury – currently retrograde. Retrograde means “to do good“, and while the madding crowds say communication becomes difficult during during Mercury retrograde, how the planets deal with us can be modified … it is up to us how we use the planets; they can raise us up or pull us down, as the pundits tell. Modification of Mercury retrograde for you personally could come about easily as Mercury is retrograde in Capricorn until 12 February. 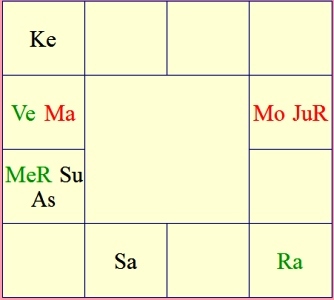 Capricorn is a movable sign, so effects can be modified somewhat easily in a movable sign – by approaching Mercury with the following shakti mantra: Om Aim Bhum Budhaya Namaha. “Aim” is vachana shakti, the power of articulation, calling, guiding and teaching.